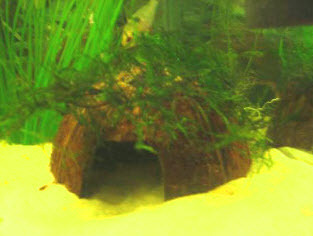 Turn a coconut into a natural aquarium cave! Hammer a nail into the coconut, remove the nail and drain the coconut milk. Saw a line around the coconut and crack open the coconut along the line. Use a flat head screwdriver to remove the pulp from the coconut shell. Draw an outline of a doorway on the coconut and cut out the opening. Boil the coconut aquarium hut, remove and replace the water until clear and wash the coconut shell. Sand off the coconut hairs if desired or cover the top of the hut with moss.